When prospectors set up camp on Cherry Creek in 1858, Denver emerged as a lightning rod for the extraordinary. Time has washed away so many unusual stories—from the dark days of nineteenth century Law and Order League lynchings and the KKK's later rise and fall to the heroism of suffragettes and the touching plight of the gypsies. Elizabeth Wallace knocks the dust off these details and introduces readers to characters like world heavyweight boxing champion Charles L. "Sonny" Liston, hit-man turned rodeo promoter Leland Varain, aka "Diamond Jack," and the city's daring wall dogs, whose hand-painted building advertisements are fading reminders of a bygone Denver. Elizabeth Victoria Wallace was born and educated in England. In 1978, she moved from England to the United States with her husband and three young sons. Over the past ten years, she has published seven books that include works of regional history, travel and historical fiction. Wallace is very active in the community, giving workshops and seminars and attending conferences. She also supports the Gathering Place, a daytime shelter for women and children in Denver. 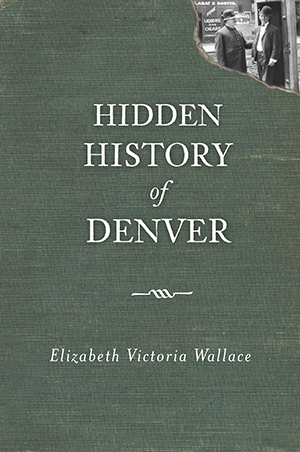 Wallace is the founding member of the Castle Rock Writers and a member of Denver Woman's Press Club and the Society of Women Writers and Journalists in London. She has appeared live on television and radio and is known as one of the “Word Mavens” of Kansas City for originating a monthly program on the local NPR affiliate that discussed the origins of everyday sayings.